The common name, Henbit, comes from the observation that chickens like it. Humming birds also enjoy this wild edible for the nectar. Henbit provides valuable erosion control in many cropland fields in the southern U.S. 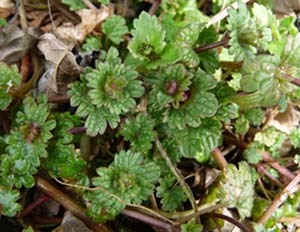 Unlike many of its relatives in the mint family, henbit does not have a strong or distinctive mint scent. Henbit is easily confused with Purple Deadnettle (L. purpureum), which has petioled leaves all the way to the top leaves. 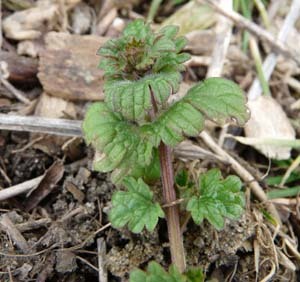 The middle and upper leaves of L. amplexicaule (Henbit) do not have petioles. Henbit leaves are also typically smaller than those of Purple Deadnettle. Henbit is an important early season source of nectar and pollen for honeybees. Distinguishing Features: Henbit is a winter annual that grows between 10 and 30 centimetres tall. The plant is sparsely covered with fine hairs that point downward. This plant grows from a shallow taproot that becomes finely branched. The low growing, upright to sprawling plants have a number of weak stems arising from the base that may be erect or almost lay on the ground. The stems are square and green but often become purple with age and may root at the lower nodes. This edible weed reproduces solely by seed, and each henbit plant can produce 2,000 or more seeds. Henbit also spreads by producing roots on lower stems that touch the ground. Flowers: Tiny, dark pink flowers occur in rings in the upper leaf axils. Open flowers are somewhat orchid-like, with a white face and dark red spots. Each flower produces a four-seeded fruit. Fields of Nutrition has medicinal benefits and vitamin/mineral content of Henbit. 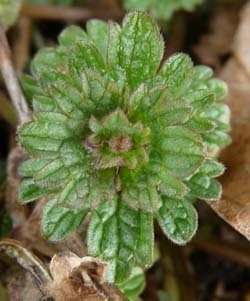 Leaves: Henbit leaves are arranged in opposite pairs. The lower leaf pairs are farther apart from each other than the upper leaf pairs. Leaves are round or heart-shaped, are .95 - 1.9 centimetres long, and leaf margins have rounded teeth. Veins of the upper leaf surface are recessed, giving it a somewhat wrinkled look. Lower leaves grow on short stalks, and upper leaves clasp the stem. Height: Henbit can grow anywhere between 10 and 30 centimetres high. Habitat: Henbit grows by roadsides, in cropland, pastures, in waste areas, in gardens, and on lawns. Henbit prefers light, dry soil and cultivated soil. This edible plant originated in Eurasia and Northern Africa. It also grows in Australia, South America, western Asia, Greenland, and throughout Canada and the United States. Edible parts: Henbit can be consumed fresh or cooked as an edible herb, and it can be used in teas. The stem, flowers, and leaves are edible, and although this is in the mint family, many people say it tastes slightly like raw kale, not like mint. Henbit is very nutritious, high in iron, vitamins and fibre. You can add raw henbit to salads, soups, wraps, or green smoothies. According to Natural Medicinal Herbs (dot net) this plant is anti-rheumatic, diaphoretic, an excitant, febrifuge, a laxative and a stimulant. Similar plants: Purple Deadnettle, Creeping Charlie.